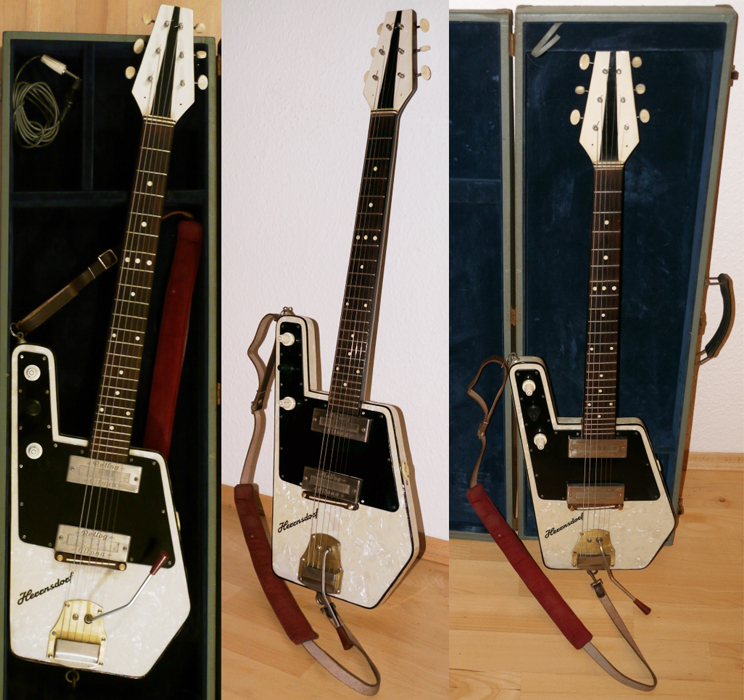 A couple of days ago I posted about a 1957 Ibanez Hi-Tone guitar, about which I knew almost nothing. 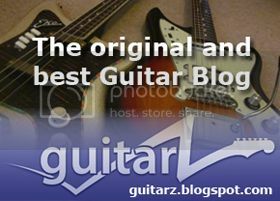 I inquired since, with a little help from our readers, and though I don't know much more about the Ibanez (but that the model should be a EG-1580), I found many guitars that are very similar (with different headstocks, pickguards, control plates, bridges, stoptails, cutaways, one or two pickups, in bridge or neck position, different woods, etc...) - if not identical - under various brands: on top is a Teisco, on the right is a Guyatone LG 50 H, down are a Maestro LG 50 and a Guyatone LG 40. There were also Star and Antoria models, and I also found out that there's been a vintage Japanese Hi-Tone brand... So this is another complex cross-branding story for a cool guitar! And let me wish you all a happy new year for 2013! 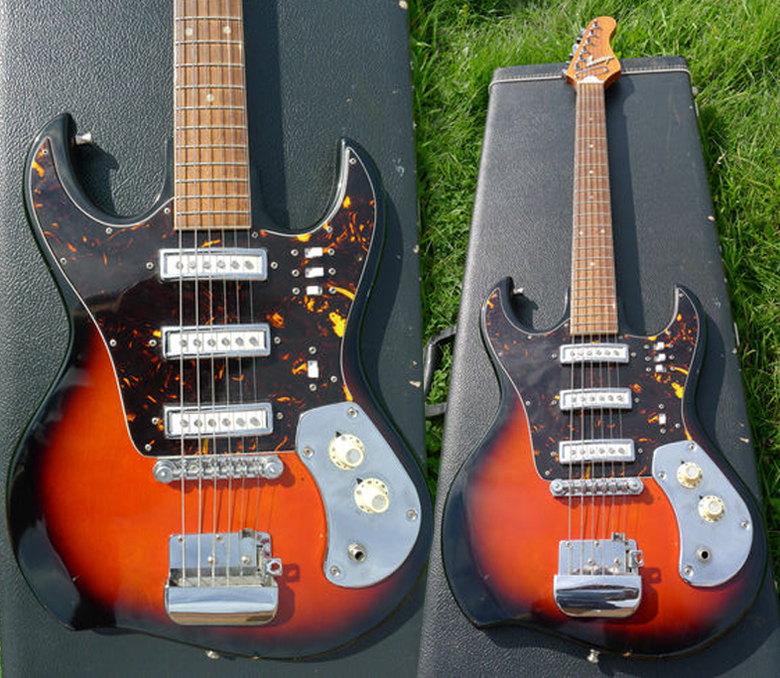 These guitars usually copy classic designs - mostly stratocasters, but also Mosrites -, but this one I've never seen before, and it's surprisingly announcing the pointy superstrats of the following decade - doesn't it have something of a classic 1980s Ibanez? The back part even has this strange twist reserved for eccentric models... And the metal control plate is cool too! 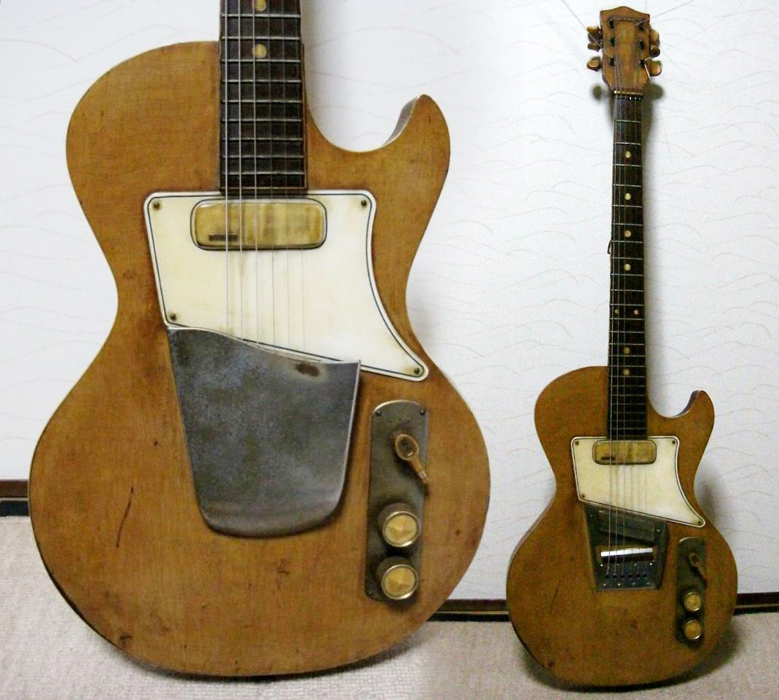 This 1957 Ibanez Hi-Tone is a collector's dream (if its eBay seller is right about it - I couldn't find any other information source). One of the first Ibanez ever built, it also has an original though very simple design, and quite special hardware with a compensated bridge and a stoptail that I'm surprised didn't become a standard (must have a flaw, though I cannot guess what) - and it has a maple body. Thanks to David for sending a link to this guitar! 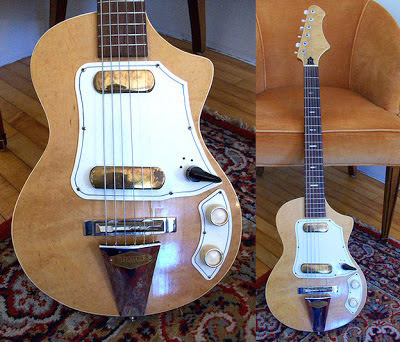 The seller of this great looking bass must be among the coolest Ebayers out there. Nothing seems to excite him. Not even the prospect of getting a pile of cash for this first class instrument. This guitar really deserves selling up, I think. To me, this a superb contemporary instrument. It absolutely looks the business, from it's smooth metallic surfaces to its roundy/spiky contours, to it's individual string pickups. I can imagine thumping those strings and it sounding like slamming the lid on a grand piano. Wow! This Tokai Talbo Bass just oozes class! The Talbo Blazing Fire, to give it it’s full name, was made from the same aluminium alloy (AC-4B) that racing car engines were made of and were first produced in early 1982 but the B-135 bass wasn’t introduced until 2000. The long, 24 fret, neck and that stretched top horn combine to create a very elegant looking instrument. One of the quirks of the guitar is that the neck angle adjustment is achieved by a hex nut on the side of the neck at the 20th fret. The, however, bass seems to use the more common, heel adjustment, accessed through a hole in the pickguard, which seems pretty archaic these days. The Talbo Bass featured a stylised aluminium body (which featured internal cavities), and the TB-8AL circular pickup. Combining active circuitry with the metallic body, Tokai claimed that the sound was both unique and versatile. 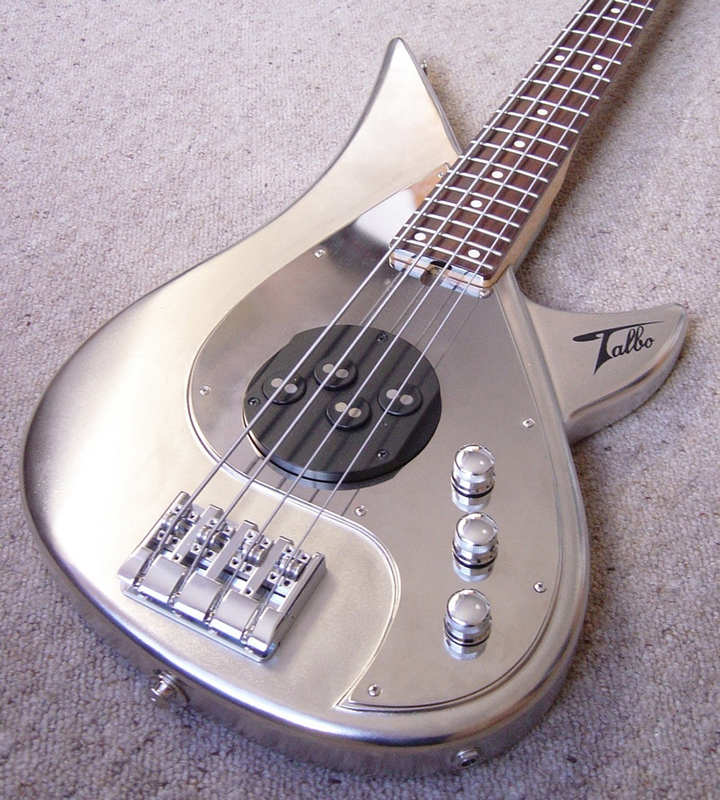 Tokai Talbo B-135 Bass Guitar. 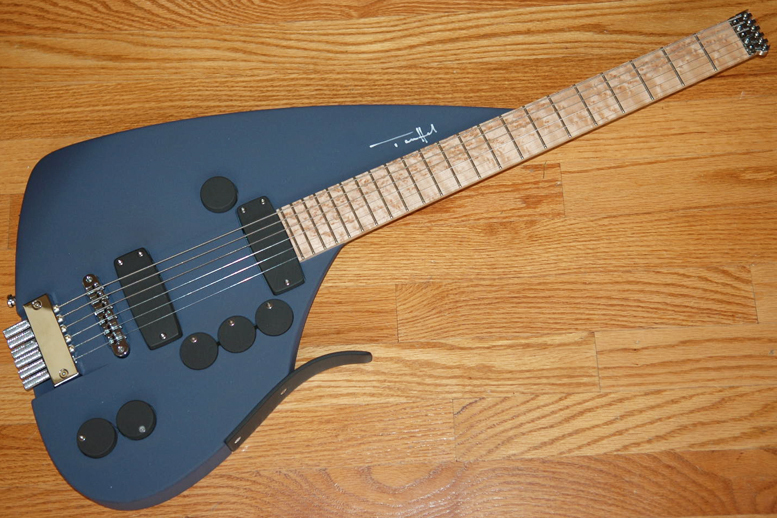 Scale length: 34" - Long Scale, 24 frets. The 'antigua' finish is most unusual for a Gospel and makes this guitar probably a one-off. I love the shape of the scratchplate, it really improves the otherwise quite dull outline of the ES-335 template. A rather breathtaking title for a nice little "phew" (sharp intake of breath or appreciative whistle as is your wont) guitar. 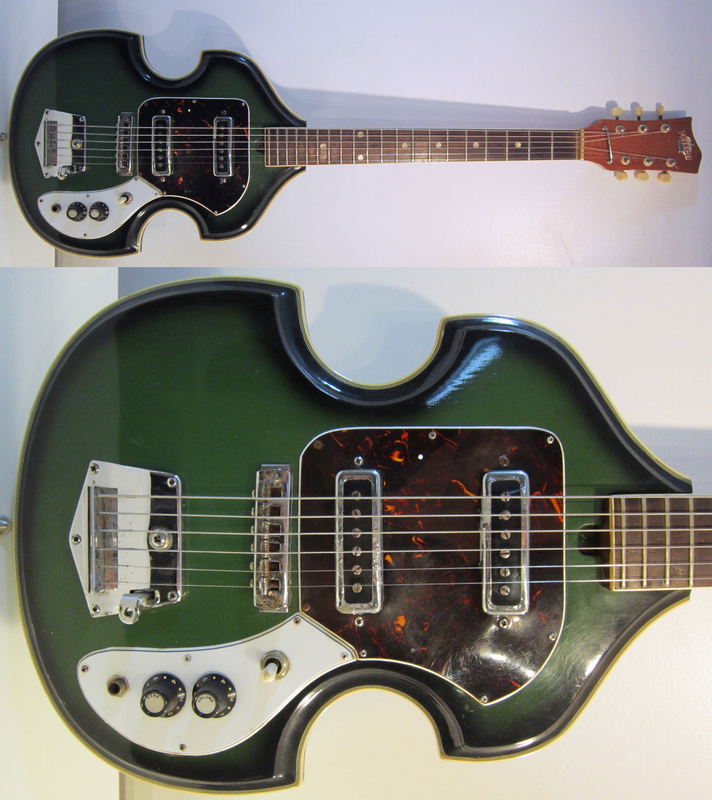 A Teisco violin shaped guitar currently languishing in post-celebrationary haze over on Ebay.com. Now, we have featured these guitars TWICE before on Guitarz, here and here but I hope we can be forgiven for showing one again. These violin shaped guitars were only made for about a year (1968) and so are pretty uncommon (if not downright rare) and they were sold under at least two different badges, just to confuse things even more. This one is badged with the Teisco Crown logo (my own one is blessed with the Satellite brand). If one turned up with a Guyatone, Silvertone or Kawai logo, it wouldn't be too much of a surprise. This guitar was produced in red-burst and green-burst colourways and with varying scratchplate (pickguard) combinations of white, black and tortoiseshell (based on my own observations). 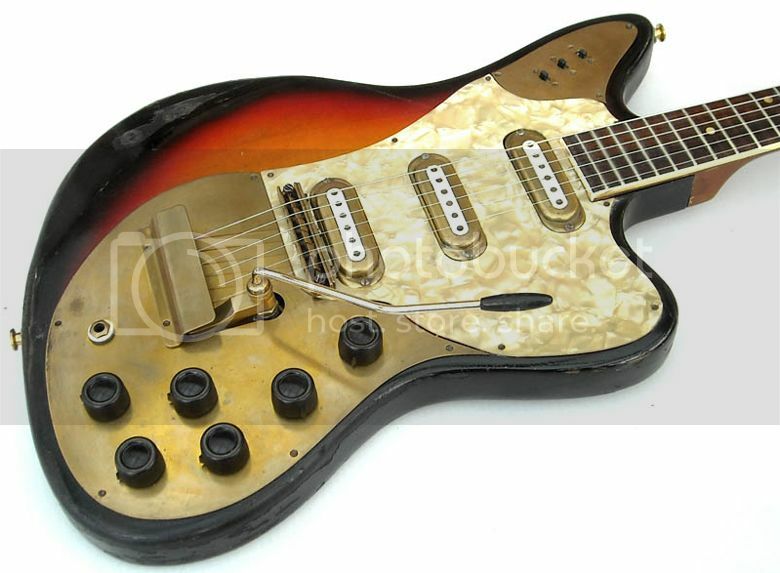 This one has a typical Teisco tremolo that can be seen of lots of other models, a fairly standard bridge for Teisco, nicely yellowed nylon tuner bushings and absolutely typical Teisco pickups. Ahh don’t you love these guitars?? Really nice green burst paint job here. Cool shape looks very mod and neat. Great for garage rock or you retro rockers out there. 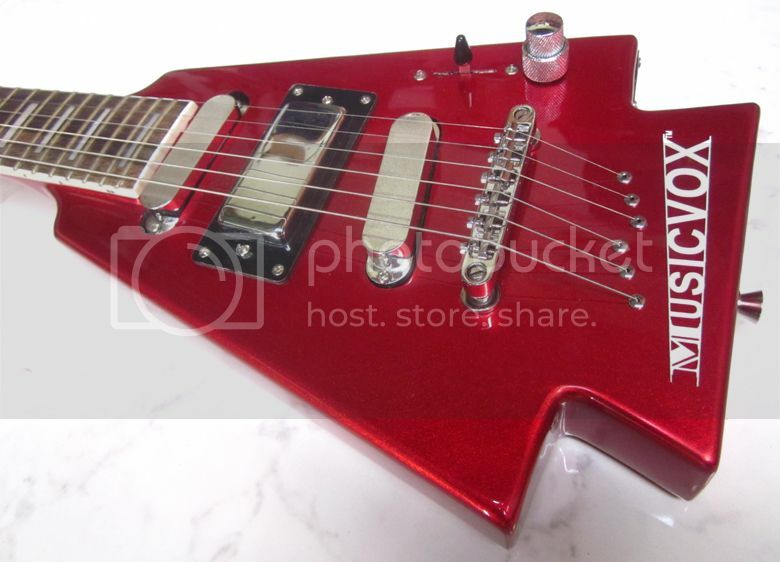 Also this guitar is perfect for people with smaller frames or you lady rockers out there. 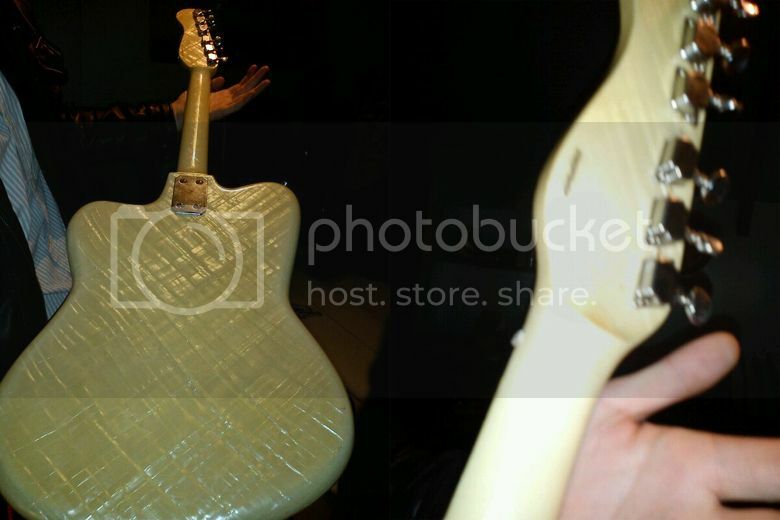 Its a little bit smaller than a normal guitar. The guitar is great cool shape. A few scratches here and there and the guitar could use some new strings. This guitar is very rare and difficult to find. It plays nice and sounds amazing! I will agree that they do play (very) nice(ly) - my own one has an excellent neck and an action that no one would be ashamed of - and, even if those pickups do only sport an output of 4-5K, they produce a decent rich sound that anyone, who was attracted to the vibe of these kinds of instruments, would be more than content with. Anyone still feeling flush after the Xmas excess or who woke to find a nice little wad of crispy banknotes in their stocking from Santa on Christmas morning, this little treasure is yours for 850 US Smackeroonies (plus the usual). Just to illustrate Marshall Will's remark in the comments, these guitars are pretty sleek. That keeps it light and comfortable to play. The only downside is that the lower "horns" can dig in your thigh when playing sitting down. But, this is a guitar for standing up and showing off with so no problem really, eh? I have no idea what this guitar might be... It's much likely German from the 1970s, though the shape makes me think of a Defil - a Polish brand. The pickups look quite Musima - or one of the many Markneukirchen guitar brands -, but the pickguard could be from Höfner, and I've seen this kind of bridge and trem on many German guitars. 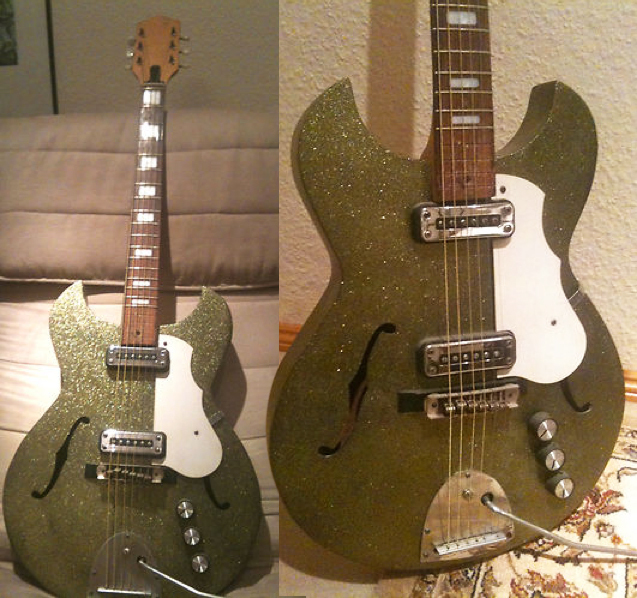 It has obviously been refinish in this quite peculiar glitter khaki green and the knobs probably come from a radio, so I bet it's a Frankenstein, still something tells me I should recognize the original model - am I not a double florentine hollow-body guitars fan? So, anybody has an clue? Edit: I was wrong all along, it's an Egmond 2ES1 Colorado! 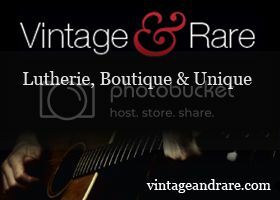 Labels: double florentine cutaways, German guitars, hollow body, Markneukirchen, vintage guitars, What's that guitar? I feel all holiday-ish so I decided to make myself the gifts of posting about my favorite guitars, even if they've been showed already, as it is the case for the magnificent Teuffel Tesla (here and here, with all the information you need). 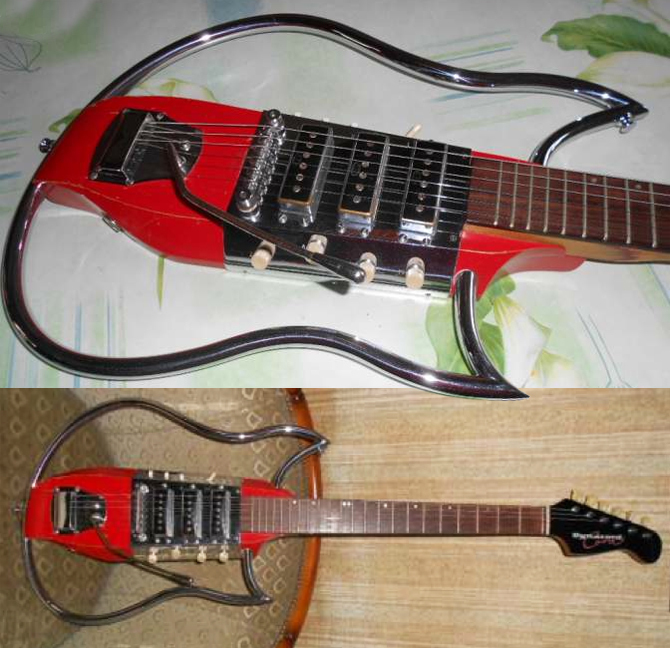 To me, this guitar has one of the best design ever, superior to many classics and standards... The first time I saw it, I was suffocated, and I was more when I checked the price - it's a very limited hand-made model, the kind you can never have... One could copy the outline, but it will never be the same, it has so many carefully designed, conceived and manufactured details! Anyway, I'll never play good enough to deserve to put my fingers on its fretboard, so I'll just go and make some brutal noise on my Musima! Ovation Breadwinner Limited - the one and only! Yes, I know you've seen an Ovation Breadwinner Limited on Guitarz already (here and here - there's everything you need to know on these previous posts), but come on, who can stop contemplating this marvel? I'm very in love with this guitar, as I am with its older sister the Breadwinner that I have the honor and pleasure to possess since 20 years - I still feel lucky to have had the opportunity to buy it as a young guitarist and use it on stage as my main guitar for many years! 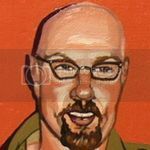 And it's only after GL Wilson invited me to write for his blog that we figured out that we were both Breadwinner cultists, and we knew we would get along! OK, enough blah-blah, kneel down and adore! It's always a real pleasure to show a Burns (whatever incarnation) instrument here, for they always have such handsome designs - the real British elegance! Look at this TR2 bass, apparently a really rare model, about which it's impossible to find any information - don't you feel that you need to be dressed in tweeds to play that? This Silvertone 1457 is a classic amongst the classic vintage guitars, but for some reasons we never had the chance to show one on Guitarz. As you can't fail noticing, this Silvertone model was actually built by Danelectro and shares the typical Dan'o features - masonite body, lipstick pickups and above all a boldly pop design - one of their bests, all in curves and claws! 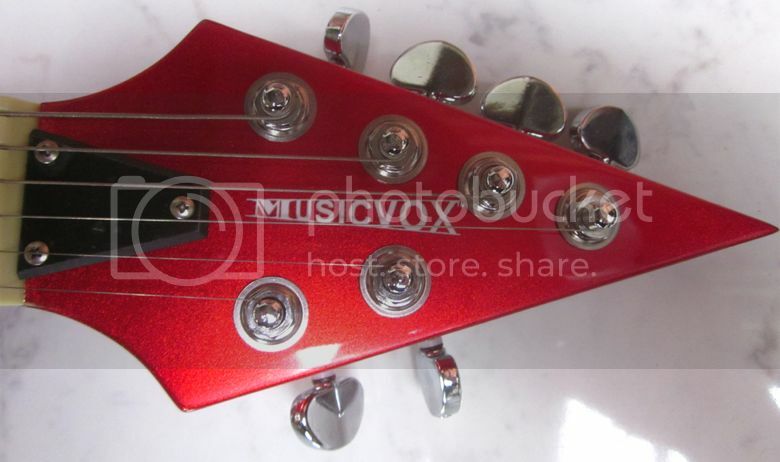 And I love the headstock, even though it's technically absurd! Another characteristic of the 1457 - shortly released in the mid-1960s - was to be sold together with an amplifier case - something than never took but was a nice gadget for beginning guitarists at the time. Silvertone was the instrument line of mail-order catalogs Sears and Roebuck, and had their guitars made by Harmony, Kay and Danelectro; the 1457 package with the 'Amp-in-a-Case' has been very popular, and was even sold with a a guitar playing method on a 45rpm record! Probably the easiest way to understand this instrument, dubbed The Shield, would be to watch the YouTube clip below. Some would say it's not really a guitar, but as it's an electrified fretted, stringed instrument I reckon it's worthy of a place here on Guitarz. Based on a Greek drawing, it was handbuilt for the current owner by an American luthier and finished by another luthier in Italy. You do have to wonder that if it really is the marvellous instrument that the seller claims, and the "only one in the world" at that, then why is it being offered for sale on eBay (with a Buy It Now price of $1,999)? This weekend I ended up at some guy's house in Galicia (Spain), and I took photos of what I found. Apparently it's a 62' Élite, with 4 humbuckers. The pickup selector stands for none, bass, middle, bass+treble, treble and all. 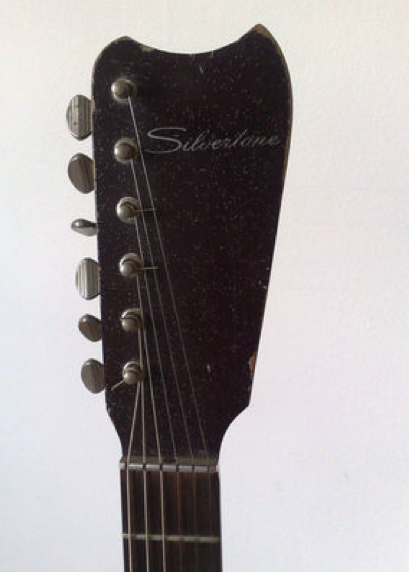 Very thin body, with a flashy finish all through the neck and the large headstock. The bridge was modified on repairs, it used to have a tremolo. The photos are bad quality, but I thought you would like to see it anyway. We plugged it in and sounded amazing, the pickups are in perfect condition. Hope you like it! 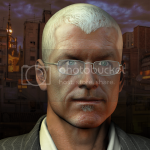 Keep up with the blog, it's amazing! Hi, thanks for sharing. But surely those pickups are singlecoils rather than humbuckers? Possibly they can be grouped together into humbucking mode? I notice also that the tuners have been replaced for a set intended for (or taken from) a guitar with a 3+3 headstock arrangement. Anyway, you can read a little more about this guitar and similar models over at Fetish Guitars. This is hanging on the wall at a barbershop in Toronto. Any ideas? The brand is "Comet." It looks like a Stella with pretentions of becoming a Strat. Has anyone out there seen anything similar? We've looked at various Framus Strato and Strato Deluxe guitars before here on Guitarz but I do think this model bears looking at again. 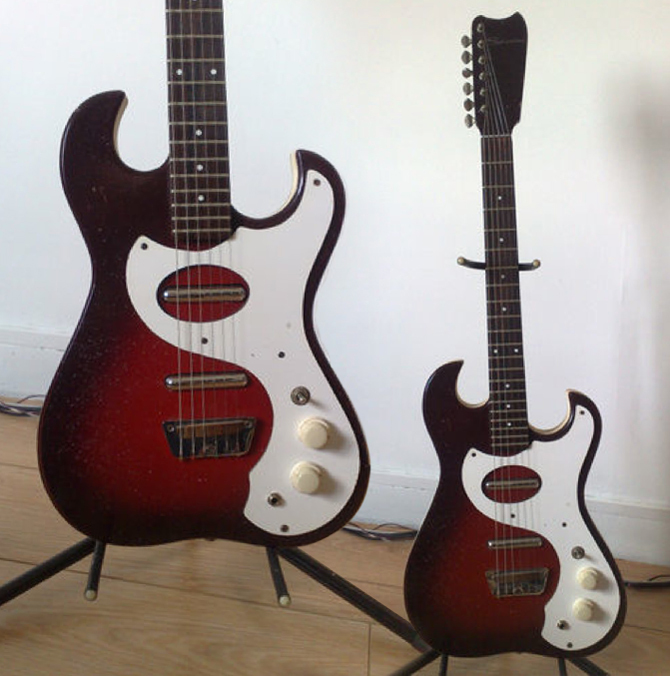 This 1963 Framus Strato Deluxe sports three pickups - note how they are all mounted straight with none at rakish angles as often seen on these guitars - and a bewildering array of knobs and switches. As someone who gets confused by a Les Paul's layout of volume and tone controls for each pickup and who would prefer a single volume control, a pickup selector and nothing else, I wouldn't relish trying to remember my favourite tone combinations on this Framus but I have to admit it does look rather cool. 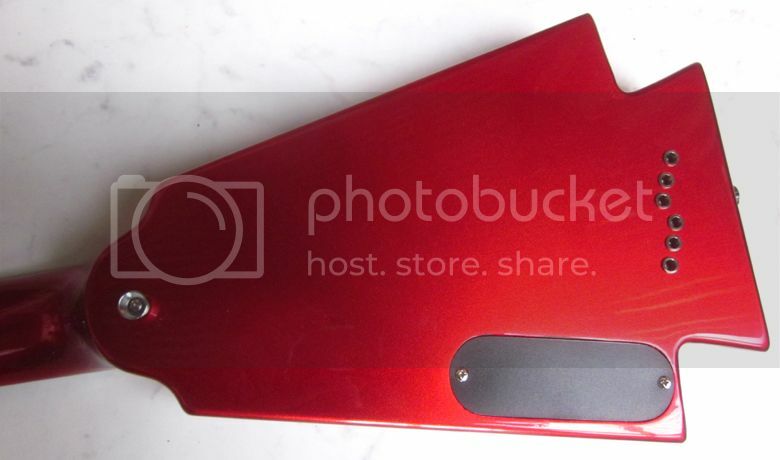 As do the metal cover plates, with one huge plate acting as a vibrato cover plate and control plate. It's also worth looking around the back and at the neck heel. That's quite a peculiar looking bolt-on neck arrangement. I'd imagine it's a bolt-on tenon joint system. Yes, there does appear to be a huge gap between body and neck but as long as the tenon itself is seated firmly into the body it shouldn't cause any playing/performance difficulties. 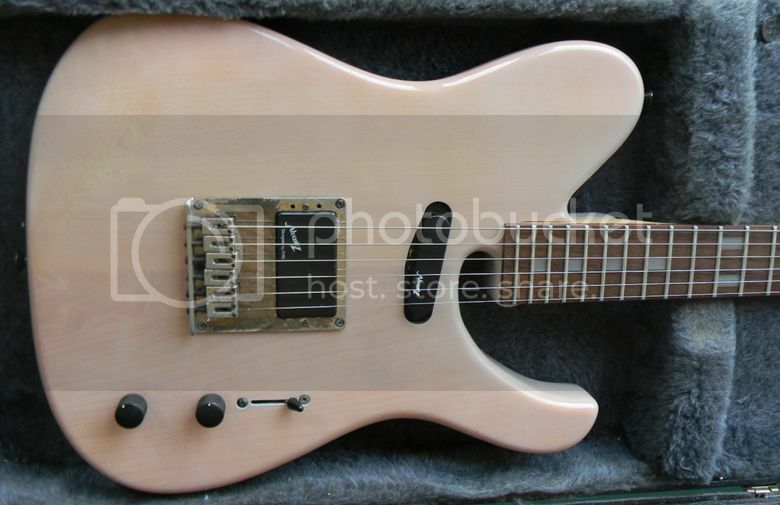 Currently being offered for sale by Wutzdog Guitars of Germany via Vintage & Rare priced at €490. 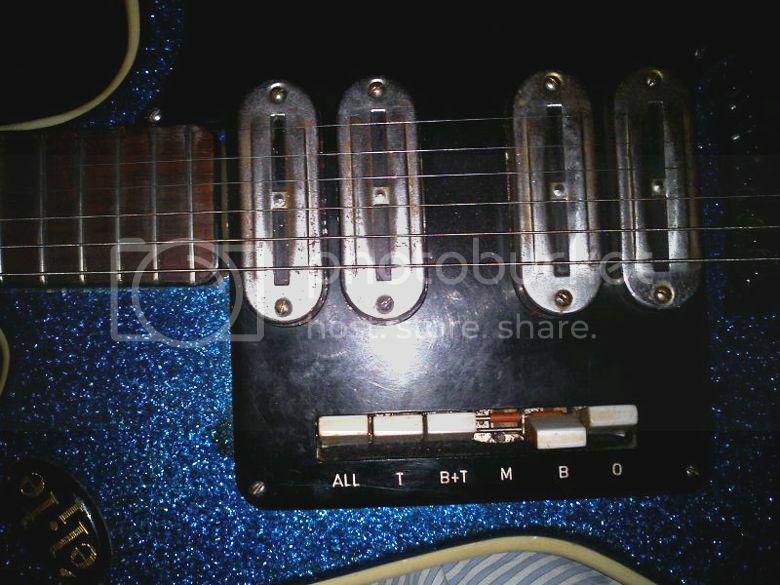 You can easily recognize here an Egmond guitar with its white plastic block comprising the neck pickup and a slanted pickguard ending in a control plate under which all the electronics are. 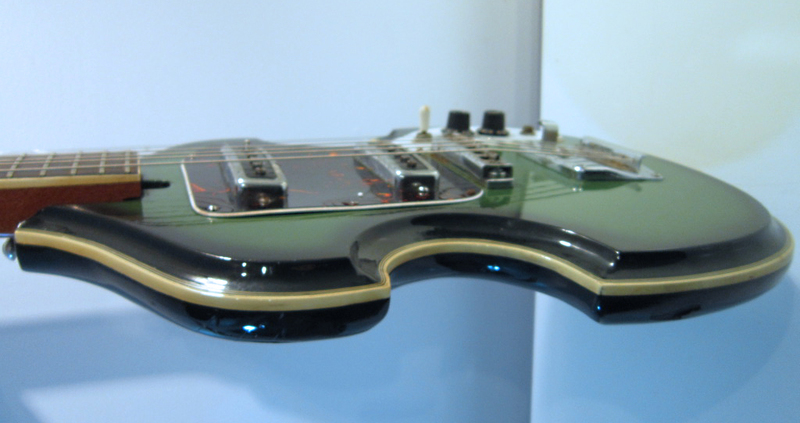 This system could turn any guitar into an electric one - either hollow or solid body. Even knowing that this early 1960s Manhattan model was a cheapo (and concretely this means no truss rod), its minimalist design is quite cool and this model with very pop Lake Placid blue finish is in good condition. Screaming Leaming has created guitars for the likes of KISS, WASP, Rick Derringer, Black Sabbath, Megadeth, Van Halen and others; we previously looked at another of his 6-string creations here. This Unicorn guitar, again carrying the Gearhead brandname, is the kind of thing that several years ago I'd scour eBay for in order to get a few cheap laughs on the blog. It has that unusual distinction of being quite dreadful and quite wonderful at the same time. 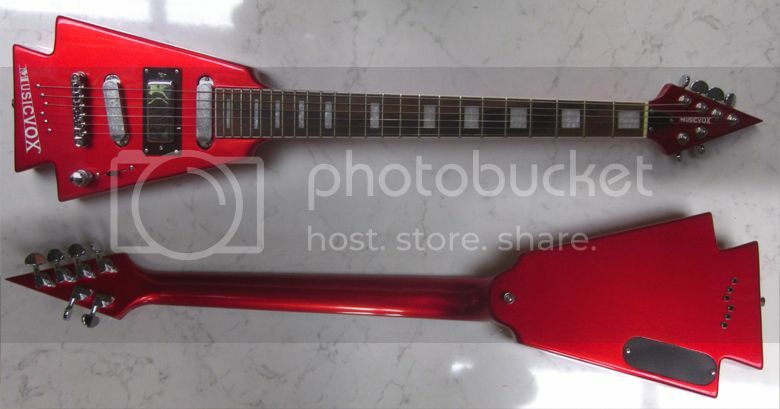 The seller claims that it is an "exceptional guitar" which "plays super nice", but I do have to wonder what condition it was in before it had a "$250.00 action job done to it". Currently listed on eBay with a starting price of $3550 (ouch!) and a Buy It Now price of $3790 (more ouch!). For my other favourite horsey guitar, be sure to check out the Dobbincaster! 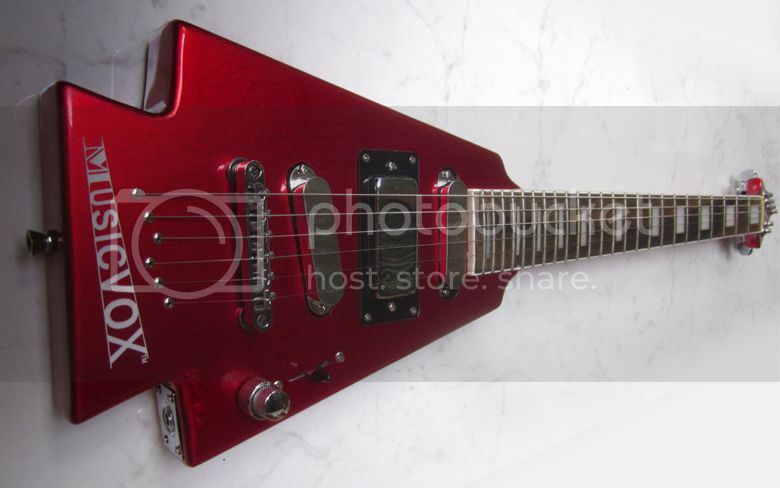 I should definitely not show this Herrnsdorf guitar but keep it secret and buy it for myself as a reward for all the time and energy I've spent here sharing and celebrating our electric idol... But it's just not the right time so I'll just spill it: this guitar is an ultimate collector dream! Herrnsdorf was a DDR Markneukirchen brand even more eccentric and radical than the average as you can see, that also released the Rellog Gitona pickups. This design is just amazing, there should really have a brand that revives these DDR beauties before they fall into oblivion or disappear the vaults of collectors! The Landing L300 "Strat Bass"
Further to yesterday's post where we were discussing the new Squier Vintage Modified Telecaster Bass and where I suggested that Fender may as well issue a Stratocaster Bass next, Jeremiah has emailed me to tell me that Landing Basses already offer a Stratocaster-inspired bass, the L300. It has a 30.5" short scale length (or optionally 32") but otherwise all features - pickup placement, controls, etc - are as on a Stratocaster guitar. With such a pickup layout it doesn't mean you'd necessarily get the best sounds for a bass instrument - especially seeing that the bridge has by necessity been moved backwards to accommodate even a short scale bass scale length resulting in a larger gap between the bridge pickup and the bridge - but I guess that aesthetics were more important in Landing's opinion in a desire to make this bass look as much like a Strat as possible. For those who like the Strat body but would prefer proper bass pickups there are other options available in Landing's range. 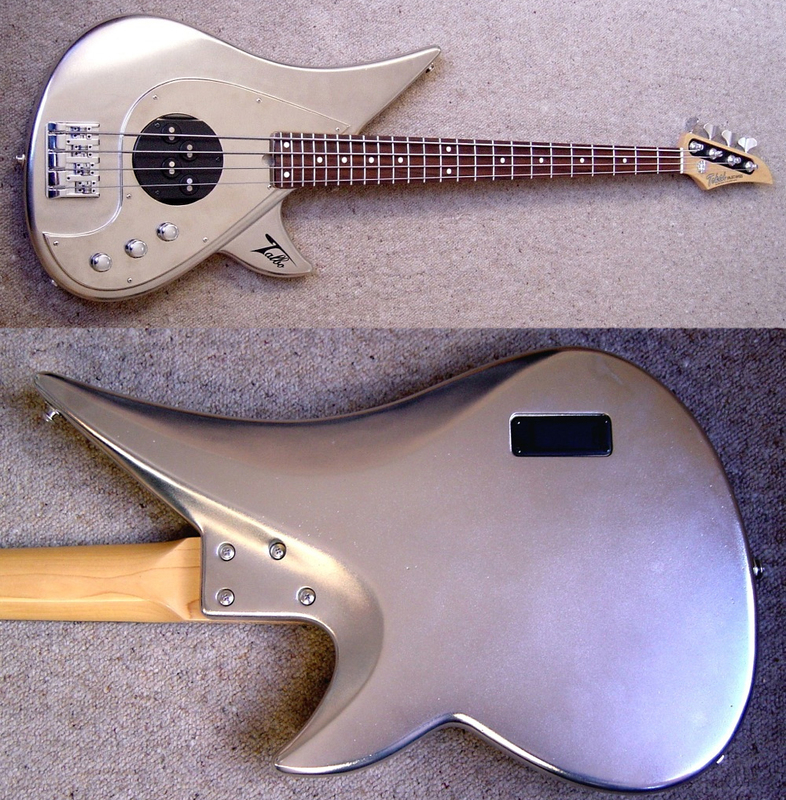 They also produce their own Telecaster-inspired bass, the TBASS. 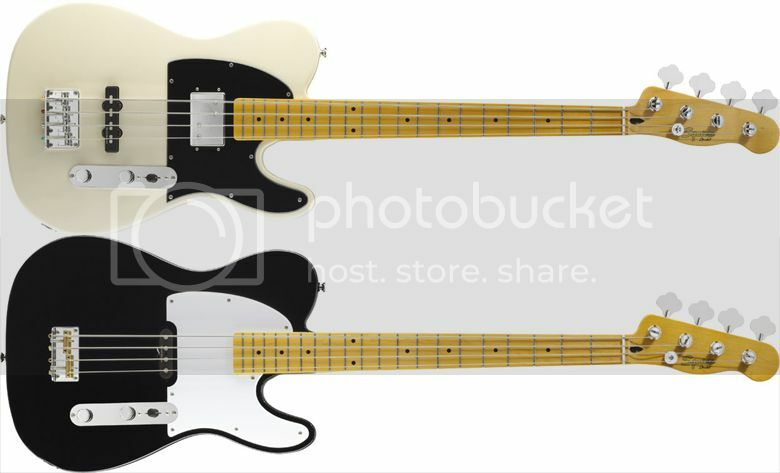 Here are a pair of new basses from Squier's Vintage Modified Series, the new Telecaster Bass and Telecaster Bass Special (pictured top). These are not to be confused with the original Fender Telecaster Bass which in itself was based upon the original slab-bodied Precision design before it was redesigned to have a more contoured Strat-like body. 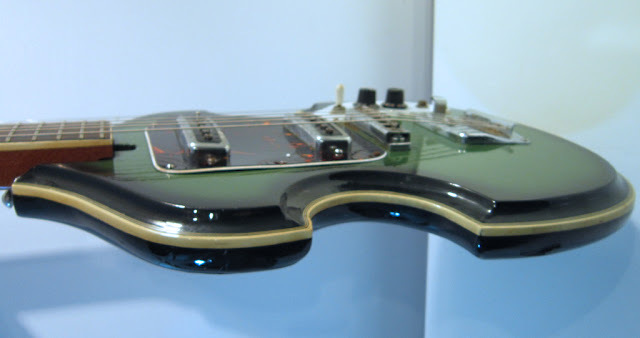 1970s examples of the Telecaster Bass (of which the Squier Vintage Modified Precision Bass is quite an accurate representation) featured a huge humbucker pickup in the neck position instead of the centre-position singlecoil pickup. It also had a twin-cutaway body, rather than the same basic shape as the Telecaster guitar as we see here on these new Squier offerings (although it seems to me that the body has been lengthened). I guess that Fender/Squier must have decided that bassists wanted the same shape as the Tele guitar but I can't imagine it'd balance anywhere near as well balanced as the double-cutaway P-bass shape. It all seems a bit silly to me. What's next, the Stratocaster Bass? And no, the Precision is not already the bass equivalent of the Strat. It was originally the bass partner to the Telecaster, and if anything, the Jazz Bass was the Strat's opposite number in the bass camp, although some would argue that with its offset body shape the Jazz Bass's natural sibling would be the Jazzmaster/Jaguar. But of course these days there's a Jaguar Bass too. I wonder how long it is before Fender/Squier issue a Jazz Bass-bodied 6-string guitar? Hey, I reckon I could work for Fender marketing too with ideas like that. With the Squier Telecaster Bass having a singlecoil pickup similar to that in the original P-Bass, and the Deluxe version having a 70s Telecaster Bass humbucker in the neck position and a J-Bass unit nearer the bridge, no doubt these new Telecaster Basses will appeal to players out there, although for me the designs are far too Frankenstein-like; for example that pickguard design is quite patently created for a guitar and not a bass. But never mind my nitpicking, if you're interested get yourself over to the Squier website and check out the specs for yourself. 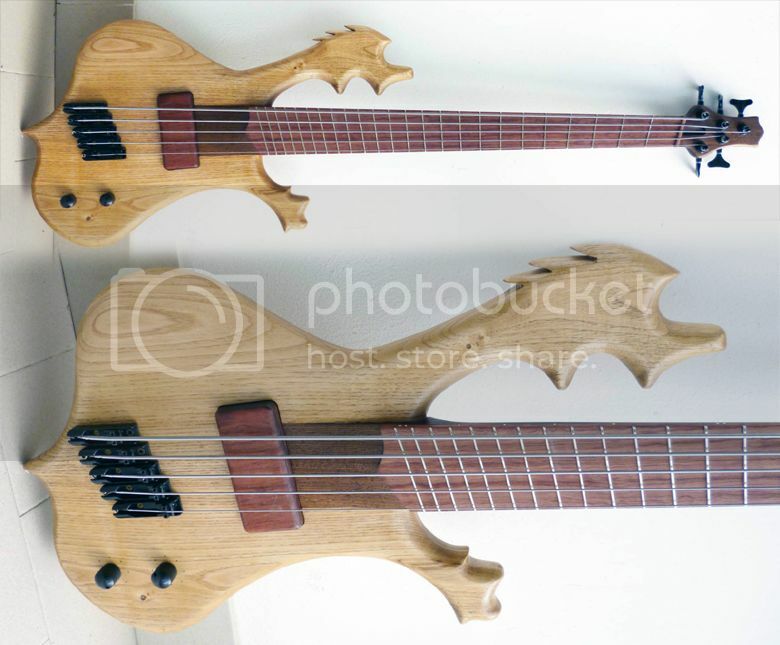 Prometeus Mothra multi-scale/fan-fretted 5-string bass with moose antlers! I don't know if the horns on this handmade Prometeus multi-scale 5-string bass are deliberately supposed to resemble moose antlers, but that's my interpretation. I think it would suit a band from Scandinavia, or Canada or Alaska. Perhaps. In actual fact, Prometeus is from Italy and this particular model is named "Mothra" which may mean Japanese Godzilla movies were the inspiration. Confused? OK, never mind all the above speculation, let's look at the specs: 34"-32.5" scale over 5-strings, 24 frets, quarter-sawn Wengé neck with deep set-in construction without neck heel, quarter-sawn Bubinga fingerboard, French Chestnut body, 1 ceramic humbucker (shielded and wax-potted) with vol/tone controls, black hardware, dual action truss rod, Shellac-based finish, total weight of 3.7kg). Currently being offered for sale on eBay with a Buy It Now price of $1,399. 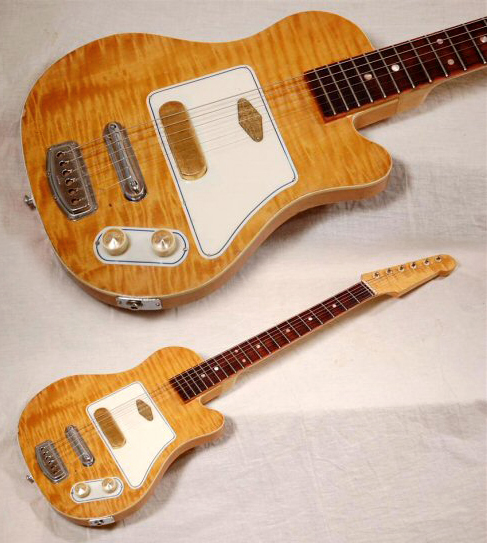 We've looked at these mid-1990s Alvarez Dana Scoop guitars before (here and here) but the guitar featured in this eBay auction is the first that I have seen of the less common Telecaster-inspired Nashville model. Made in Korea, the guitar features Alvarez's own "designed by EMG" passive pickups and is finished in a very fetching translucent blonde that to my eyes is reminiscent of a Fender Mary Kaye finish. Note that the scoop cutaway is not quite as radical as on the other guitars in the Scoop range and only extends beneath four strings as opposed to all six. 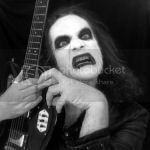 This guitar is curently listed on eBay with a start bid of $499.99 and a Buy It Now price of $599.99, but note that the auction finishes later on today (in 14 hours time at the time of writing). This exceptionally rare, custom-color 'semi-transparent Wine Red' "350 Mono" bass weighs 8.60 lbs. Solid alder body and two-piece medium-profile rock-maple neck with a nut width of 1 5/8 inches and a scale length of 30 1/4 inches. Single-bound rosewood fretboard with metal nut, zero fret and 20 original jumbo frets frets with clay dot position markers. Specially shaped headstock with "Mosrite of California, USA", "By Semie Moseley" and the Mosrite "M" logo decal in black. Black plastic bell-shaped truss rod cover with two screws. 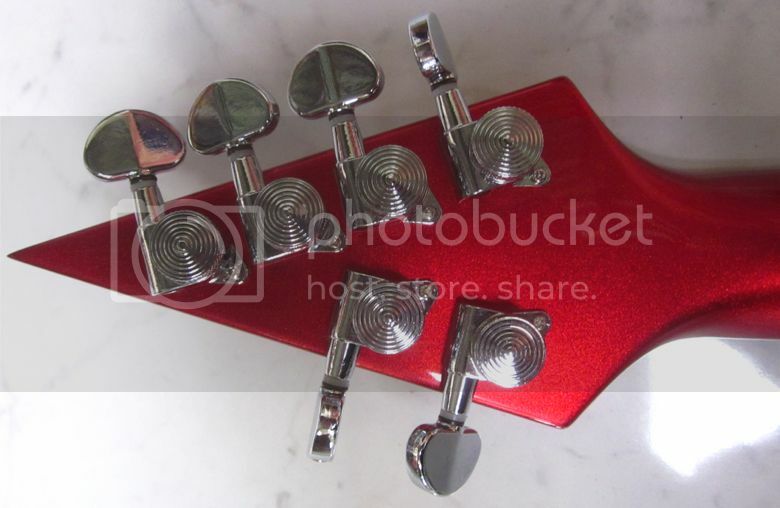 Individual Mosrite of California closed back tuners with crown shaped metal buttons. The serial number is stamped in blind into the twentieth fret of the guitar. Four-bolt neck plate. 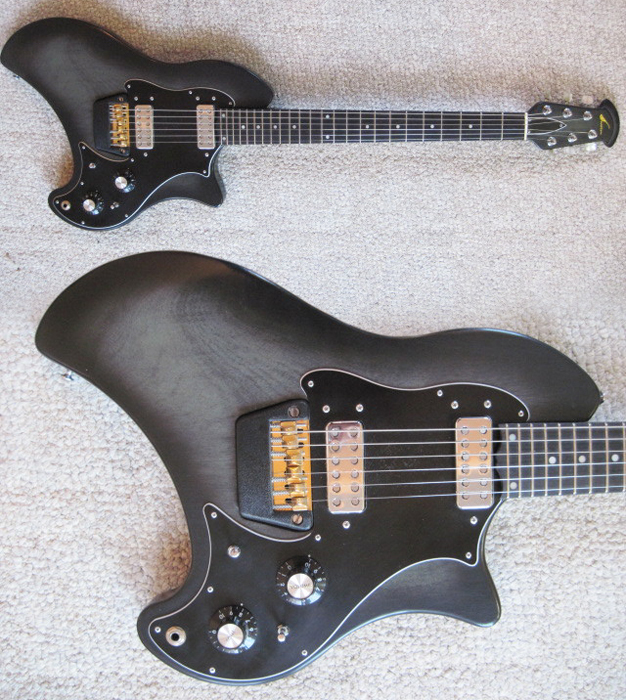 Two Mosrite 'Humbucking' pickups with black plastic covers with "Mosrite of California" embossed on the lower edge and outputs of 5.45k and 4.95k. Three-layer (white/black/white) plastic pickguard with eight screws. 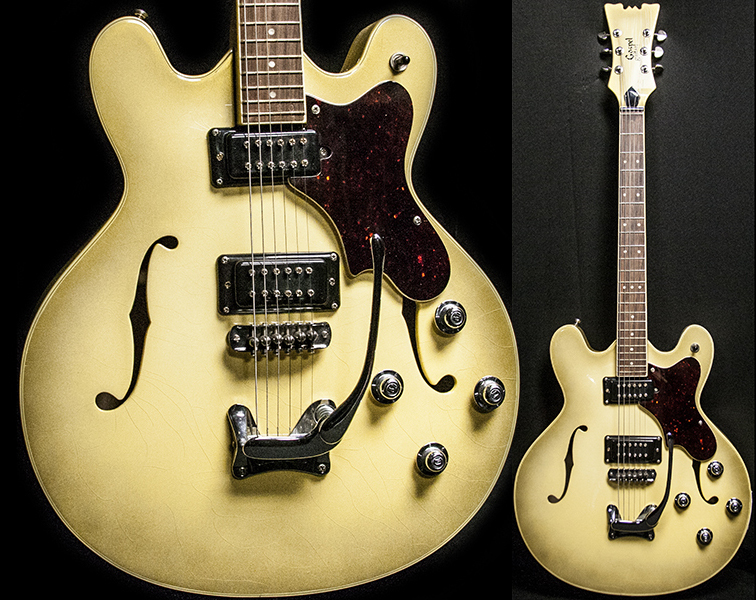 Four controls (two volume, two tone) plus three-way pickup selector switch, all on the pickguard. Mosrite metal 'hat type' knobs with "M" stamped on top, numbered from 1 to 5 (one with a "V" and the other with a "T". Jack socket on pickguard on treble horn. Mosrite bridge with four individually adjustable saddles and Mosrite aluminum and rosewood tailpiece secured by three screws. 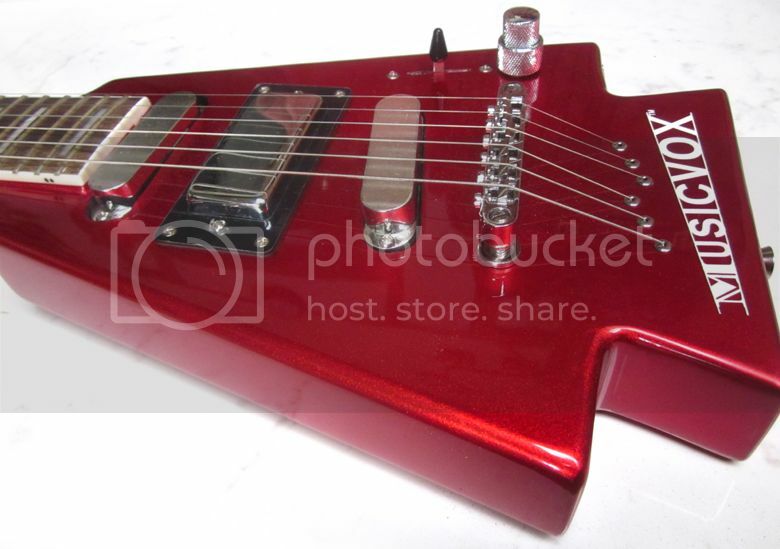 The 'Translucent Wine Red finish is bright and vivid and shows no fade. There is some very light finish checking on the back and a few small and fairly insignificant edge chips. 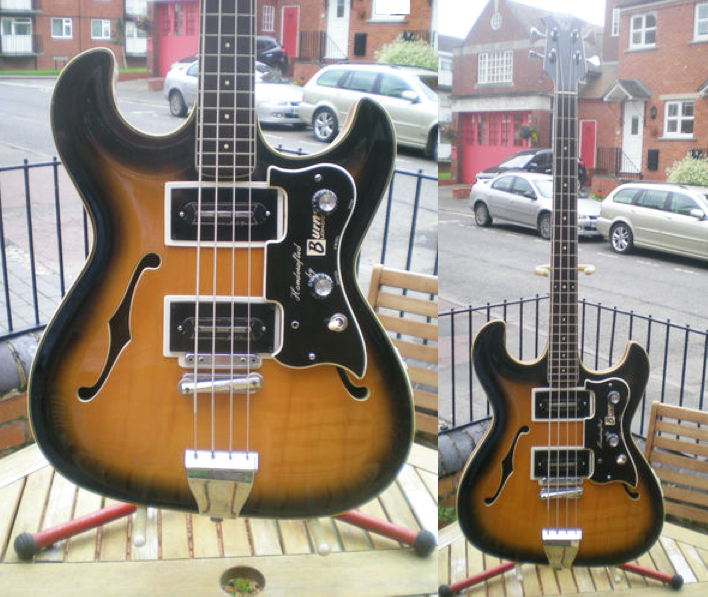 Overall this super rare and all original, early seventies Mosrite Bass is in exceptionally fine (9.00) condition. Housed in its original three-latch black hardshell case with black leather ends and burgundy plush lining (9.00). We have never seen another Mosrite "Brut' Bass. I think that probably says it all. I love those "Bart Simpson" tuners, by the way. Currently being offered for sale by Fretted Americana via Vintage & Rare priced at €2185 / $2800. 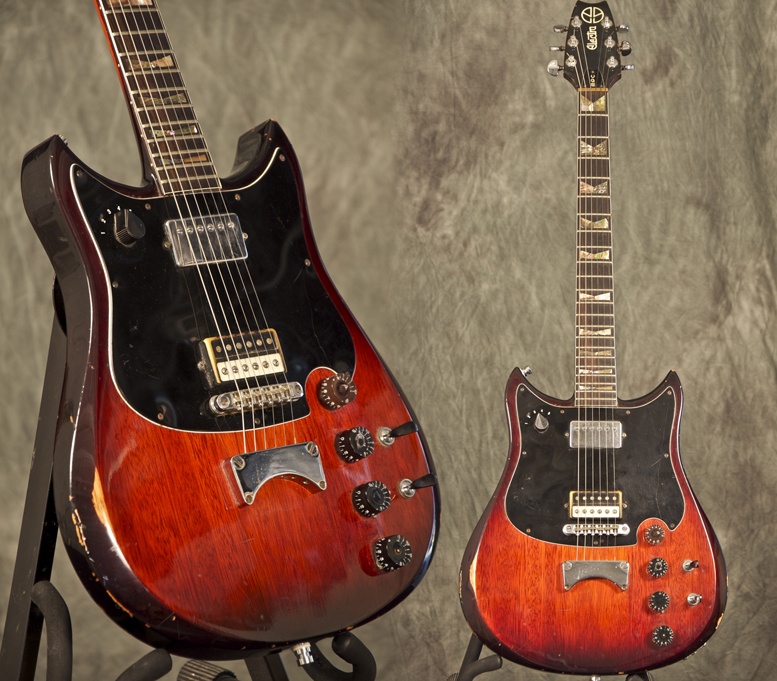 Here at Guitarz we really admire people like Matt Eichen, a vintage guitar enthusiast who loves retro instruments so much that back in 1997 he decided to start his own line of retro-inspired guitars. He wasn't content to merely create another range of Fender or Gibson knock-offs, he wanted to create something quirkily different as a homage to the past but with modern playability and production quality. 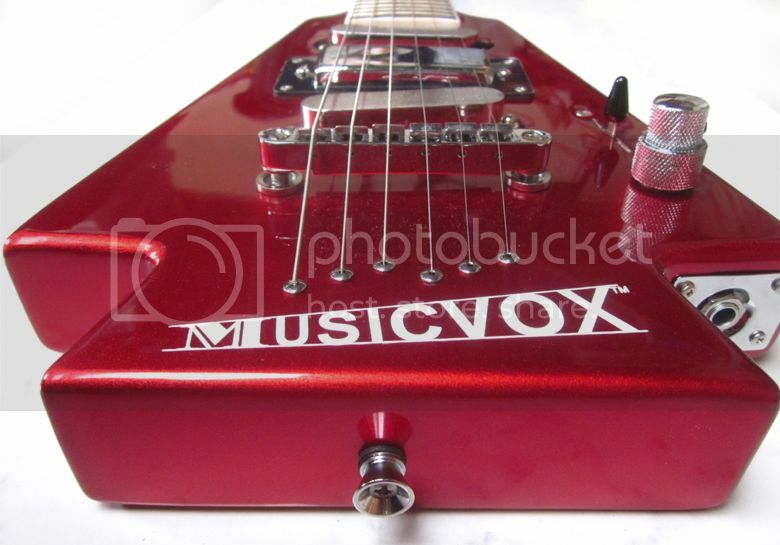 And so Musicvox was born, and their first model - the Space Ranger - was quite a head turner - classic singlecut guitar and bass models but with an unfeasibly large lower horn and a very eccentrically-shaped headstock. These weren't guitars for just anybody, certainly not for the hordes of conservative-minded guitarists who can only think in terms of Strat, Tele, Les Paul, SG. With a Musicvox guitar you needed to be in the Matt Eichen mindset; you either "got it" or you didn't. 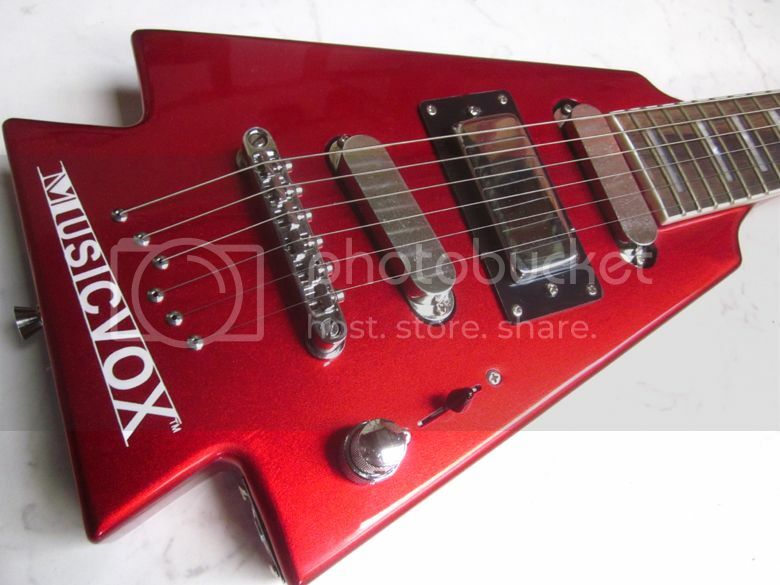 Finding it difficult to find a distributor for these "wackily"-designed guitars, Musicvox began selling their guitars directly to the public via the internet, and indeed were one of the first guitar brands to do so. Of course this is common practice nowadays. Musicvox followed the Space Ranger with the Space Cadet - a similar design but with the eccentricities toned down - and models included the Space Cadet 12-string bass which was not only one of the more competitively priced 12-string basses on the market but also highlighted Musicvox's agenda to create instruments that challenged the norm. 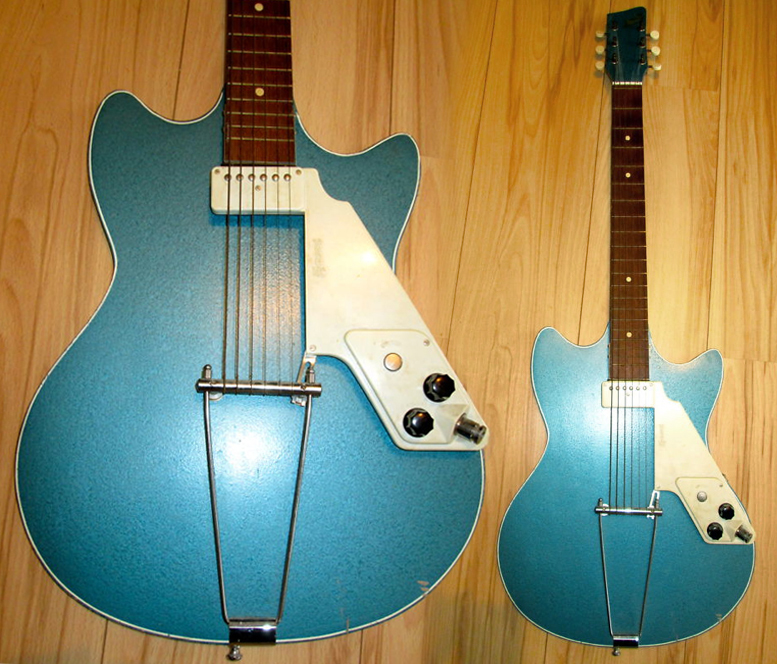 In 2002 a pair of Musicvox Space Ranger guitars were featured in Goldmember, the 3rd instalment of the Austin Powers movie series, which exposure should have proved beneficial to Musicvox sales, but soon after for personal family reasons Eichen was forced to wind down the company. Fast forward best part of a decade, and Eichen - buoyed up by the fact that he noticed that there were still a lot of people out there talking about Musicvox guitars and a continued interest on the internet - decided to re-launch the brand. 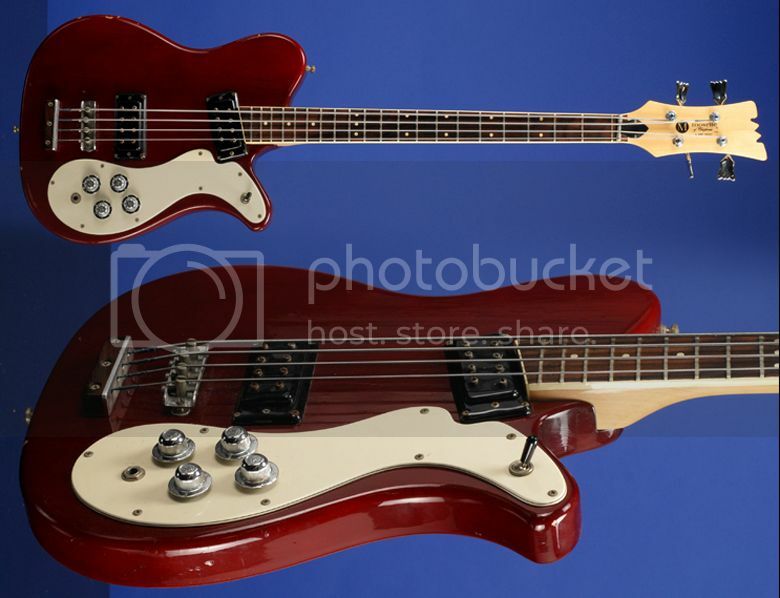 Of course the models that got everyone talking in the first place - the Space Ranger and the Space Cadet - were back and were accompanied by some new designs - the MI5 guitar, bass and 12-string guitar, and the spear-like Space-inator guitar and bass (the prototype was named the Strataspear but a certain other company took umbrage and issued a court injunction against the use of the name). Matt very kindly sent a Space-inator all the way to deepest darkest Pembrokeshire in Wales, UK for Guitarz to review. This particular example is finished in a flawless candy apple red. Other colours I have seen pictured are gold flake, silver flake, and taxi cab yellow - all are extremely eye-catching. Upon taking the guitar out of the box I was immediately struck by the sheer quality of the finish. With the metallic candy apple red I could almost have believed that the Space-inator was made completely of metal. I was also very impressed that it emerged from the box more or less in tune after its Atlantic Ocean crossing; just two strings were slightly flat and needed tweaking. So, let's take a closer look at what we've got here. 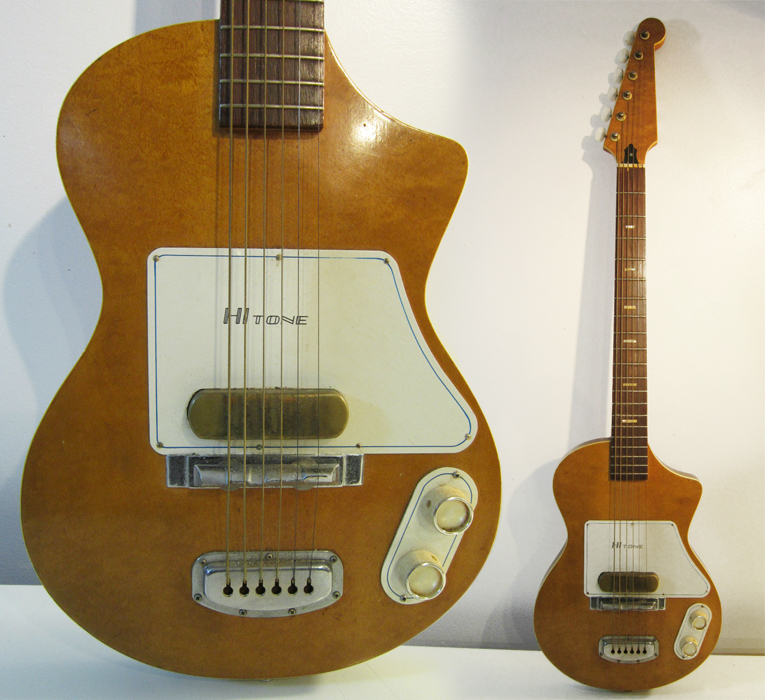 The Space-inator is a small-bodied guitar weighing in at just over 4 pounds. It has an angular, arrow-shaped body not unlike a more flared-Steinberger shape, and also perhaps vaguely reminiscent of the Burns Flyte, whilst a friend who I showed it to commented that it looked like a "sawn-off Flying V". The headstock is a compact very pointy spear-shaped affair with locking tuners arranged in a 4+2 formation a la Musicman and certain vintage Teisco guitars. This isn't merely a whim of aesthetics; if you look at the back of this very compact headstock you'll see that there would have been no room to facilitate having the G and D string tuners opposite one another in a 3+3 layout. The neck of the Space-inator has a bound rosewood fingerboard and carries 24 jumbo frets and block pearloid position markers. Of course, because of the minimal body shape, there is no difficulty whatsoever in reaching the highest frets at the body end of the fingerboard. The scale length is 25.5", and the heel of the neck blends smoothly into the underside of the guitar body. The Space-inator is in fact of neck-through construction. That and the through-body stringing behind the Tune-o-matic style bridge ensure that the Space-inator gives plenty of sustain, something which may have so easily have been compromised on such a small bodied guitar. It would have been so easy for Musicvox to unimaginatively equip this guitar with a pair of humbuckers or else three Strat-style single coil pickups, but instead they have chosen to do something much more interestingly versatile. What we have here are three pickups controlled via a 5-way switch, with two low-noise single coils in the neck and bridge positions and a mini-humbucker in the middle position. I have previously commented on this blog about the usefulness of such a rarely-seen layout after having played a friend's Aria "Dragon Strat" which had a stacked humbucker in the middle position. What it means is that you can get the classic single coil sounds in the neck and bridge positions, but you can beef up both of these in the inbetween positions, and of course get a full-throttle humbucker in the middle position. I find that it's a lot more useful say than a SSH pickup layout where you can only use the humbucker in conjunction with one of the other single coils (unless it has individual pickup switching). Note also that the bridge pickup on the Space-inator is angled in the opposite direction to that on a Strat. I found it wasn't as bright sounding as the bridge pickup on a (typical) Strat, but then this guitar is its own animal - if you want Strat tones that badly then use a Strat! I must confess that my favourite pickup selections were the middle three, i.e. all of those utilising the humbucker, but then that's just me. As for controls, we have the aforementioned 5-way pickup selector switch and a volume and tone on a single concentric stacked pot - very nice and simple to use, maybe too simple for some who like separate controls for each pickup; for myself I'd be happy to sacrifice the tone control altogether and just have a single volume. In use, the Space-inator does take a little bit of getting used to at first, mainly because of the way it hangs on a strap and because of that and its shape the 24-fret neck does seem to be extremely long - it feels a little like suddenly having a bass neck to contend with. Playing some solos I'd previously been playing on my trusty Aria TA-30 semi I did find I was going to the wrong frets quite often. But of course none of this is the guitar's fault; it's just the learning experience that goes along with anything that is new to you. 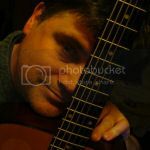 I had worried that the minimalistic body would not provide any forearm support for my right arm when playing, but in fact it's very easy to rest your right wrist against the "notch" formed by the shape at the rear of the body and I experienced no arm fatigue whatsoever, unlike that I have experienced playing other small-bodied guitars. One thing I should mention is that the Space-inator is neck heavy (or "body light", as Bertram put it). Unfortunately this is just about unavoidable on a small bodied guitar such as this, and Musicvox have done all they could to design a compact headstock. Sure, they could have made it headless, but that would likely have limited its appeal to many, and I don't think design-wise it'd have done the Space-inator any favours. But it's not necessarily a problem; it's just something that you need to know about and compensate for when playing. I mentioned resting the right wrist against the rear of the body when playing; this also helps keep the instrument balanced, and 99% of the time your left-hand is holding the neck anyway so that ought to keep it pointing the right way. But I do think it is essential that the Space-inator owner uses some form of strap locking device, just in case the guitar takes a neck-wise tumble. I use the cheap plastic variety that only cost 50 pence each or thereabouts - they are cheap but they do the job well; you don't necessarily have to go to the expense of getting specialist strap locks installed. 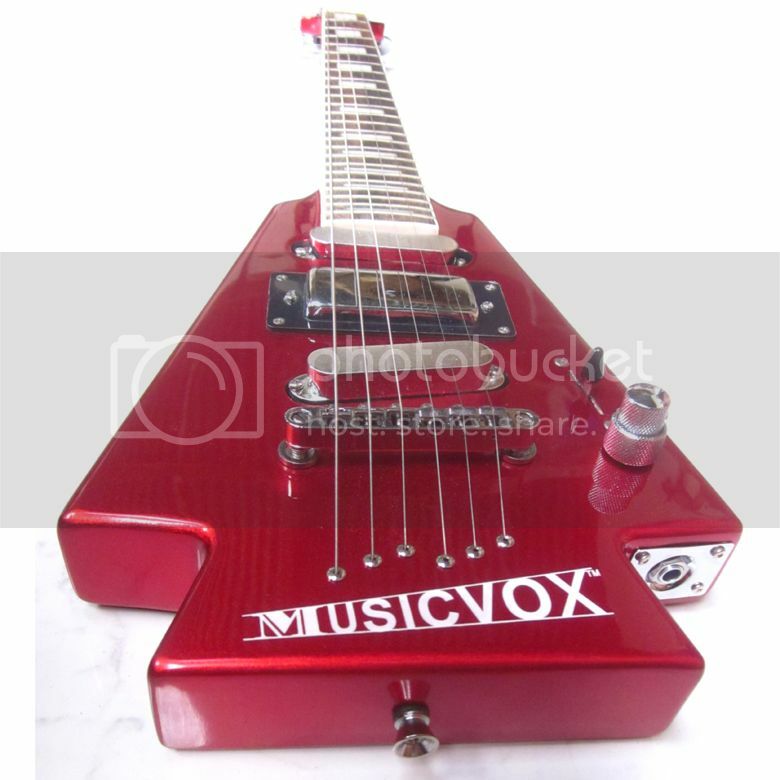 Whilst the Space Ranger and Space Cadets will appeal to psychedelic rockers, retro-themed bands, possibly a few krautrockers, rock'n'rollers and rockabillies, the Space-inator is probably the one Musicvox guitar that might appeal to those from the shredding fraternity as it excels at fast lead playing, playing right up at the top of the 24-fret neck, and thanks to that mini-humbucker it has the necessary tones required. I can also see a use for it in the studio, as not only is it a professional quality instrument with a wide tonal palette, but also the compact body size make it perfect for those times when you have a guitar strapped on at the ready whilst behind a recording console or computer. You could also use it as a travel guitar, although its full scale length and the presence of a headstock mean that it's a lot longer than some. The Space-inator is available directly from the Musicvox website, but also keep following Musicvox on Facebook where special offers are occasionally announced. Note: photos are by G L Wilson, but please feel free to copy and reproduce - although a credit to Guitarz would be appreciated - thanks! 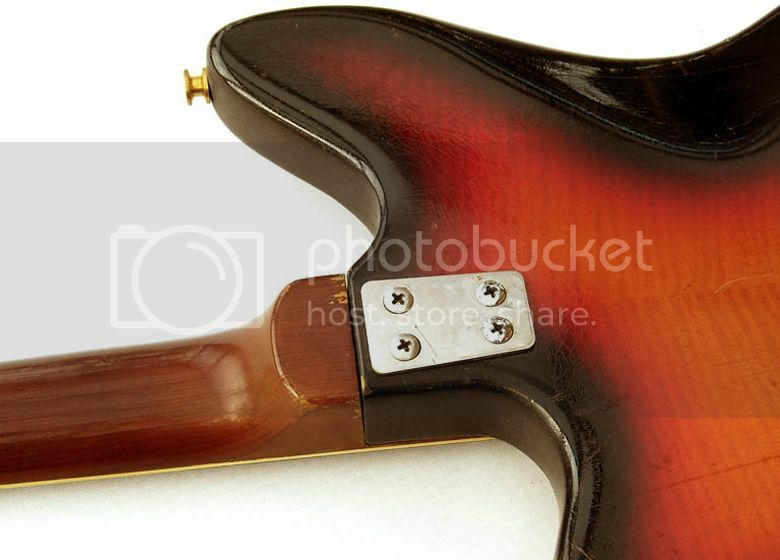 Ibanez Strat-ish 1970s electric guitar, but is it a "lawsuit" guitar? Another term that gets bandied about in the guitars section on eBay is "lawsuit", used when describing early Japanese "copy" guitars. 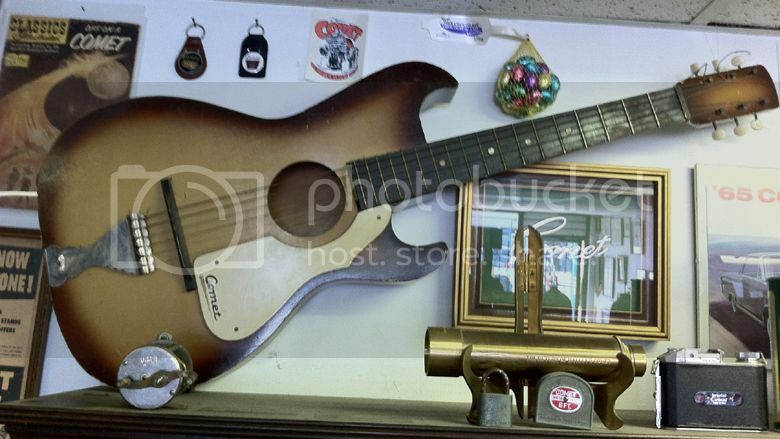 Despite the seller labelling this 70s-era Ibanez as a "lawsuit" guitar, I'd have thought it would have been extremely churlish for Fender to have filed a lawsuit because of this particular model; I appreciate that it is very Fender Stratocaster-like in silhouette but the similarities end there. Surely no-one with any knowledge of guitars would confuse this Ibanez for a Fender? 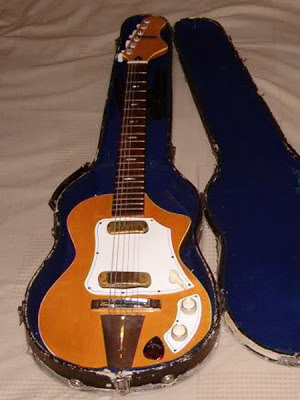 The guitar features two P90-style pickups, controls and output jack on a separate Mustang-like plate, a vaguely tune-o-matic styled bridge and a top mounted vibrato (arm sadly missing on this example) - a kind of el cheapo Bigsby if you will - behind the bridge. The neck, although it has a Fender-like 70s large headstock, is bound and features block inlay position markers. Looking at the photos I wonder too if the scale length might be nearer to 24" than a Fender-esque 25.5". This is potentially a great guitar, depending on its current condition, set-up and playability but I can't help thinking that the eBay seller's starting bid of £750 and Buy It Now price of £1250 are optimistic. Perhaps this is the Holy Grail to some Ibanez/vintage guitar collectors, but I doubt it's going to sell with those prices. As to whether it could be considered a "lawsuit" model or not, I personally don't think that it qualifies but if you know differently please explain how and why in the comments below. No more link to the selling site of this stunning Dynacord Cora - it was unsurprisingly sold very fast - there've been no more than 100 of these ever produced and it's a guitar collector's dream, when vintage surpasses once for all anything that followed in the next half century! 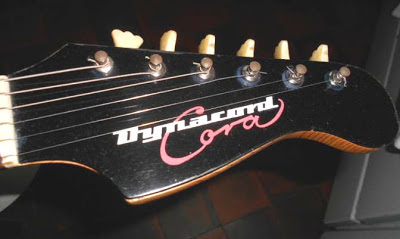 Dynacord is a major German audio company started in the 1950s, shortly teamed in the 1960s with Italian GEM (also using Schaller hardware and pickups) to produce a series of guitars including this quite unique Cora: a reduced wooden body in a double cutaway-shaped tubular frame. It was short-lived - not sure if for technical flaws or excess of avant-gardism, but it's a mystery to me that such a perfect design was not explored further and made a standard! And you know what? There was a black body model and it looked even better!